Re-design challenge at the He-Man.org fan-art forums for the second half of February--my post is here and the original thread is here. The voting thread is here--I placed second. The subject is Stridor, "Heroic Armored War Horse." HISTORY: The Stridor Project began in Man-At-Arms' laboratory as a simple experiment in robotics and simulated AI. His goal was to create a robotic mount with the equivalent of a horse's IQ, for military use. The Stridor prototype was field-tested by Teela, Captain of the Royal Guard, and over time Man-At-Arms gradually improved on Stridor's design and programming. The Stridor prototype became the template for a mass-production model that would completely mechanize the Royal Armored Cavalry. When the Eternian capital found themselves under seige by an army of centaur-like cyborgs--conquerors from the remote planet Equestris--Man-At-Arms engineered an alternate humanoid transformation for the original Stridor prototype, so that he could more efficiently battle this new threat. With casualties running high, and few human soldiers available, Stridor went into battle with his robotic bretheren, a so-called "unmanned cavalry," and drove the gladiators of Equestris off of Eternia. For several months, Stridor travelled the lands of Eternia, pondering his place in the world. But when the armies of Equestris returned to Eternia for vengeance, Stridor knew where he belonged. He raced back to the capital and again, lead his robotic bretheren to victory (with some help from He-Man). 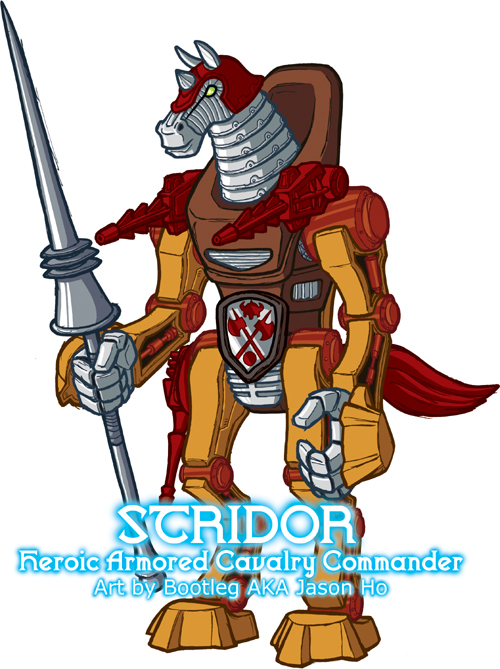 Stridor was heavily decorated for his heroism, and asked to be reinstated in the Royal Armored Cavalry, under one condition--that the other Stridor models be given humanoid forms and the freedom to choose their path as they developed sentience. King Randor and Man-At-Arms gladly agreed. Stridor was made Commander of the Armored Cavalry, and he has come to regard Man-At-Arms as his father, and Teela as his sister. Eventually, all of the Stridor models developed sentience, and were granted humanoid forms and freedom, and have chosen individual names for themselves. To this day, you can see Stridor's descendants mingling with the other denizens of the lands of Eternia. Most have opted to serve the kingdom, but more than a few have chosen a path of their own. Finallly! You finally did a cyborg horse thingy! IT'S ONLY BEEN TWO YEARS!!! It took He-Man to force you into it. Alas, He-Man doth have his charms. Looking over this I am immediately reminded of the kelpie of the lore of northern United Kingdom (Scotland and Ireland... tho it may have origins in Scandanavian folklore... mayhaps it was intro'd to UK during/after the Battle of Hastings of 1066? Or perhaps during the frequent viking raids on Saxon holy men? This is my own speculation, however. The Irish and Scots have an immense history and folklore of their own originating to even prior, some would say, the Celts). I am also reminded of the Horse Demons from Chinese folklore (sorry, no link... I couldn't find any nor do I know the name so I cannot look it up... again, apologies). 3.) BACK-F'N-GROUND!!! Seriously, since it's conjuring images of rich folklore, I say this one desperately needed something... horizon line, even a lone chiene-esque impressionistic willow would have done well. I look at this and I ask "I wonder what kind of world he exists in?" (Assuming Stridor is a he. Keep the BG simple. Silhouettes! You CAN'T tell me silhouettes are too time consuming! If so, tehn I'm making a general declaration/call for everyone who views these on a regular basis to CALL YOU OUT ON LACK OF BG EVERY SINGLE TIME!!! Nice Stridor J-HO Pretty faithful to the O.G. but if you ever redesign 30 30, he better fly or something. Style is nice and clean as usual although the scratchines on the lance keeps catching my eye. I love the coloring though. As far as the Profile / History. Sir you have waaaay too much time on your hands my friend, probably not as much as Lord Shen but still. I do however like the bit about Man-at-arms adding this mode to make Stridor a more formidable combatant. So we gonna see a Knight Stalker (I think that's the evil version right?) anytime soon? lordshen: ooh, i hadn't heard of an apaosa before... thanks again for the detailed crit, man. i appreciate the time and thought put into it. i know backgrounds are something that i need to work on, but my he-man pics won't be where i do that! the he-man stuff is all about just illustrating as many of the characters as possible. i hope that within a year or two my illustrations will cover the characters pretty comprehensively... and i won't let backgrounds get in the way! the history is really just a gathering of my thoughts on the piece while i was working on it, and all in all its a retroactive explanation to justify the way i revised the character... ZOMBIES!!! Nice redesign dude! Cool blog too! I'll link ya!